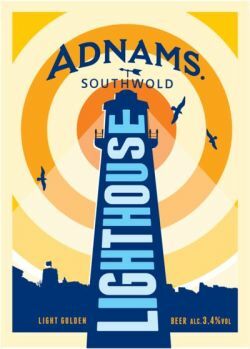 Adnams Lighthouse is developed from our Champion Pale Ale, a beer that won many awards from 1922 to 1980. With an ABV of 3.4%, this classic amber beer delivers a crisp, refreshing taste. (Contains barley). They say it's a golden beer, but it looks more of a blood-orange colour to me. The surprising thing to me was how strong the hops taste is. But the bitterness was a bit one-dimensional for me and created a wall of dull bitterness at the end of the taste, which I found off-putting. But it's a well-bodied crisp beer and a good example of what I would think is an English pale ale. Adnams are a favourite brewery of mine, and they are good at these lower ABV beers, in my opinion--their Sole Star is my preferred low-alcohol beer. So I respect this effort, but I would choose other Adnams beers over it. very inoffensive, very "weak" (i.e. - sessionable) pale ale that is a roasted dark amber colour, something i did not expect, considering the strength and label. traditional bitter overtones with a decent amount of hops. very drinkable, very enjoyable, but on the other hand nothing to write home about. a good all-rounder but nothing groundbreaking. En lettere nøddesmag til at starte med, og en god bitter humlet smag der varer ved længe. Elle a un goût pas mauvais, avec des arômes de fruits prononcé, rafraichissante avec un léger arrière goût d’houblon. Bottle - clear amber, thin white head. Strong fruity aroma. Pleasant tasting, refreshing but fairly light. Slight ting on tongue. Easy drinking with bitter finish. Bottle from drinkstore, Wednesbury. Amber beer with medium head. Aroma is faint malt. Taste is malts, mild hop bitterness and light citrus. Bland.